It’s that time again–yep, time for yard sales! With the spring thaw comes our desire to declutter our homes and ultimately our lives and who doesn’t want to make a few bucks while you’re at it? A yard sale is just the ticket but in order to make your yard sale a success one, there are a few things you should do. Get everyone in the family involved with pulling items out to put in your sale. Grab boxes or laundry baskets and put everyone to work cleaning out a specific area–their closet, their bedroom, under beds, bookshelves. If you have kids, they might not be so hot for the idea. Here’s what I do to get my kids on board with the idea of putting items into a yard sale. I tell my kids that they need to choose five things they no longer use and can live without. I make sure they understand that their toys and personal items that do sell will be money for them but large items and clothing that is sold will go into a family fund. Usually, my kids will get started with the idea of choosing five items, but once they get going they will keep finding things they want to get rid of. It’s a win-win situation! Once all the stuff has been boxed up, it’s time to price everything. With a yard sale, my advice for pricing is two-fold. If you have a lot of stuff, the more you get rid of the more money you make and the less you have to deal with after the sale is over. My experience as an avid yard sale shopper is that cheaper prices on items make me willing to buy more. A yard sale that offers a number of 25 and 50 cent items will get more of my money and get rid of more stuff than a yard sale with everything priced at a few dollars. Keep prices very low and you’ll get rid of plenty while make a little extra cash–and ultimately isn’t that the goal? To get rid of stuff and make a little money at the same time? People who shop at yard sales love to barter. Be willing to negotiate on marked prices in order to make the sale. One of the best ways to get people to your yard sale is by advertising. Put an ad in the newspaper, place signs at various points to direct traffic to your sale, put out fliers at local businesses and bulletin boards. Blow up a few balloons and put them on a yard sale sign at the end of your driveway. Tell everyone you know. Get the word out and get people’s attention and you’ll bring them in. The best yard sales are those that have lots and lots of stuff. Drivers will often make a snap decision whether to stop or not based upon what they can see from the road. The more stuff you have the more likely they are to stop. 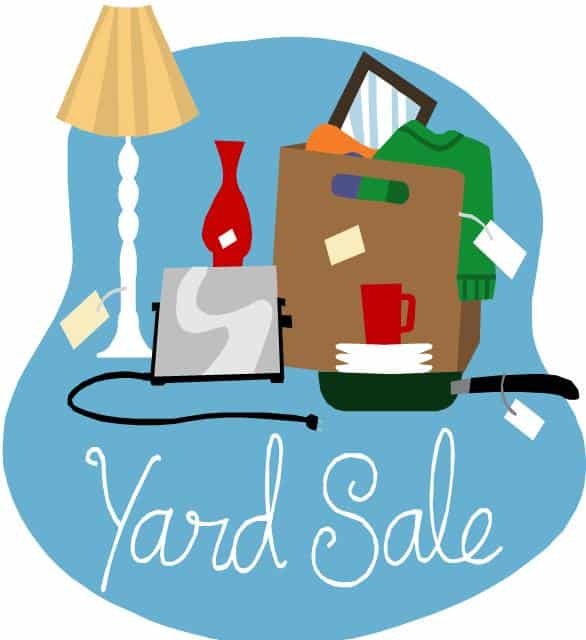 Ask friends and family if they want to join you in the yard sale and put items in. Be sure to display large items prominently so they can be seen from the road. The more you have for sale the more traffic you are likely to get. A yard sale is a lot of work but it is fun and can be very rewarding both monetarily and in that warm, fuzzy feeling you get knowing you’ve gotten rid of a bunch of items that you no longer need. Plan ahead and make your yard sale a great success!